Species resprouting from buds located belowground in non-woody (fleshy or fibrous) swellings like bulbs, corms, non-woody rhizomes, stem tubers, root tubers or belowground caudex. They are specially common (but not exclusive) in monocots and ferns, and are characteristic of the geophyte growth form. They occur in many ecosystems, often tied to seasonal stresses. They are abundant in many fire-prone ecosystems, with remarkable examples of species with fire-stimulated flowering . Species resprouting from an specialized underground woody structure like a basal burl (lignotuber, xylopodium) or a woody rhizome. They define the geoxyle growth form (see below) and are strongly tied to fire-prone ecosystems. Species that resprout from a non-specialized basal structure like roots and the root crown. They occur in many ecosystems, not only fire-prone ones. Some trees resprout from buds located along the stems, even after relative intense fire (crown-fire); these are epicormic resprouters . The buds are protected from the heat of the fire by a thick bark  or are well sunken in the stem (eucalypts). They are typical of some fire-prone ecosystems . Some plants (e.g., palms, tree ferns, cycads) resprout after fire from the stem apex: apical resprouters. This is not a typical resprouting from dormant buds, but from the original apical bud that survived thanks to the protection by leaf bases and scales. 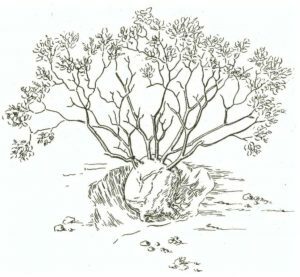 The term geoxyle was used by some early botanists [5,6] for a plant growth form with large woody underground structures and with an aboveground biomass of only a few years’ duration. Latter, the term geoxylic suffrutice was proposed for these plants with deciduous or short-lived shoots with a massive underground structure  (also termed ‘underground trees’). Consequently, the term geoxyles can be applied to any plant with a massive underground woody structure (e.g., xylopodium, lignotuber, woody rhizomes ), and suffrutescent geoxyles to those with herbaceous seasonal stems, typically lignified at the base. Many savanna plants are suffrutescent geoxyles (e.g., Fig. 1). Many mediterranean plants are shrub geoxyles like the lignotuberous species ( and Fig. 2), or the shrubby oaks that have woody rhizomes (Quercus coccifera, Q. gambelli). Given the large underground structure of geoxyles, they are very good postfire resprouters and live mostly in fire-prone ecosystems; i.e., the geoxyle growth form is likely an adaptation to fire-prone environments [1,9]. Fig. 1. 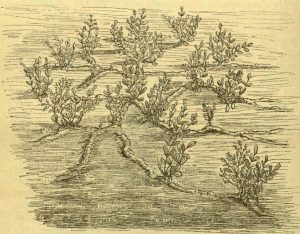 Andira laurifolia (suffrutescent geoxyle, underground tree) showing the underground woody rhizomes (from Warming 1893 ). See also Fig. 3 below. Fig. 3. Seasonal dynamics of a suffrutescent geoxyles with a woody rhizome and seasonal shoots. From . Du Rietz GE. 1931. Life-forms of terrestrial flowering plants. Acta Phytogeogr. Suecica 3: 1-95. White F. 1977. The underground forest of Africa: a preliminary review. Singapore Gardens’ Bulletin 24: 57-71. Warming E. 1893. Lagoa Santa: étude de géographie botanique. Revue Générale de Botanique 5: 145-158, 209-233. Jepson WL. 1916. Regeneration in manzanita. Madroño 1: 3-12. Bond WJ. 2016. Ancient grasslands at risk. Science 351: 120-122.